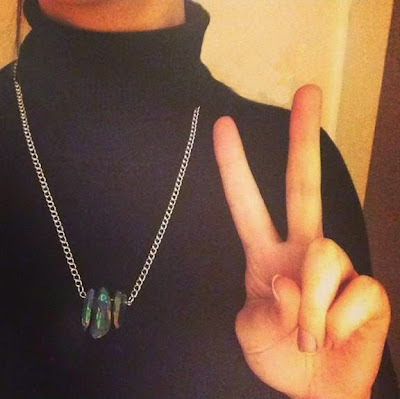 When it comes to jewellery, I love to buy from an independent handmade brand. I am absolutely obsessed with silver jewellery and especially any that have quartz and crystals involved! 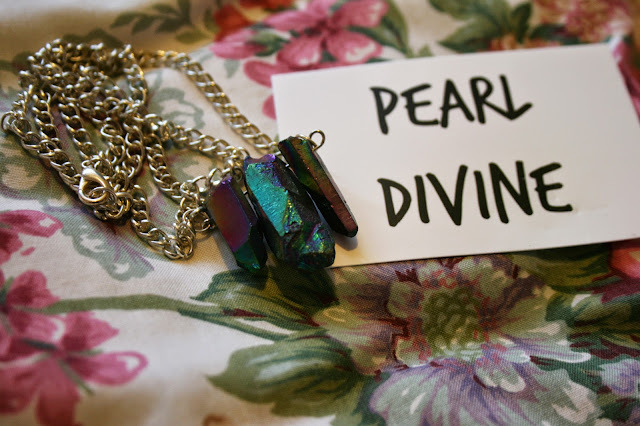 Pearl Divine is a mix of the two things I have just mentioned above - handmade and crystals galore! When I was given the opportunity to review one of their necklaces, I jumped at the chance... just look how gorgeous this necklace is! I just cannot get over how gorgeous the colours are. In different lights, the necklace changes from green and blue, anywhere to purple and copper. I've only worn it a couple of times so far but both times I've received compliments. It's a really statement piece without being too big and bulky, and it really brightens up my mostly monochrome wardrobe! For a bargain price of only £12, it beats most retail store prices, and is so much more unique. You'll definitely be seeing this necklace in an outfit post again soon! Gemma, a fellow blogger and the owner of Pearl Divine, is a really lovely lady too. She hand packaged my parcel in the prettiest pink paper with heart stickers and included a personal letter she had written for me, you don't get that kinda service on the high street! Which is your favourite necklace on the Pearl Divine website? Lovely choice.. It has my favorite color!! Oooh so many pretty things. The Cherry Quartz is my favourite I think! very pretty, love the different colors reflecting off the jewel. Yes I love that about it too! You should try something similar, it's so lovely on! beautiful and affordable necklace!! it definitely is a great gift idea! Yes I'd definitely recommend it as a gift idea! I know it's such a bargain! I hope you find something you like Julie! Yes it's the perfect size and weight! Yes the colours are so lovely in the lights! That necklace is beautiful!! I can see it going with so many outfits! Yes I'm sure I'll get lots of wear out of it! OoO beautiful! What great colors! What a gorgeous piece! I love statement pieces, the colour is fantastic and looks gorgeous when paired with a classic turtleneck. This is really sweet! I know I make most of the jewellery I wear, but I do always like to buy from independent brands myself when I do!